World over an increasing trend of climate variability is noticed, evidenced by increasing temperatures, changes in rainfall patterns and an increase in extreme climatic events like floods, landslides and cloudbursts. Agriculture being prone to slight changes in the environment suffers the most. In India, post 1970s, an increase of temperature is seen in both the cropping seasons with 0.45 degrees in the Kharif season and 0.63 degrees in Rabi season. Rainfall has also declined over the same time period with the Rabi rainfall declining by 33 millimeters, while the Kharif rainfall declining by 26 millimeters. The number of dry days and wet days1 has increased steadily over time, manifesting an increase in the occurrence of extreme weather events (Economic survey, 2017-18). Temperature increases have been particularly felt in the North-East, Kerala, Tamil Nadu, Kerala, Rajasthan and Gujarat. On the other hand, extreme deficiencies in rainfall are more concentrated in Uttar Pradesh, North-East and Kerala, Chhattisgarh and Jharkhand. The farmers in India continue to be trapped in the vicious cycle of poverty. The inability to come out of it is reflected in the number of farmer suicides over the years. Between 2013 and 2015, the suicides in the farming sector increased from 11,772 to 12,602. Bankruptcy or indebtedness accounts for 38.7% of these suicides (NCRB, 2015)4. The continued dissatisfaction has come to manifest itself in an increased number of agrarian riots in the country. India has witnessed an almost eight-fold rise in ‘agrarian riots’ between 2014 and 2016, according to data from the National Crime Records Bureau (NCRB). Bihar and Uttar Pradesh alone accounted for 84% of the total reported incidents, while Gujarat ranked fifth among all the states. The dependency of the population on farming has not reduced although the percentage share of agriculture in GDP has reduced. This poses a huge challenge for inclusive growth. Compared to the rest of the country, there is more pressure on agriculture in Bihar. Agriculture contributes to 19% GDP of Bihar - more than the national average of 14% contribution. The state’s share in land holdings in the country is 3.8 percent, whereas Bihar’s share in the country’s population is 8.6 percent. The population density of the state is 1106 people per sq. km, whereas the national average is only 382 persons per sq. km. In Bihar, 91 percent of the farmers are marginal farmers while the national average is 68 percent. Keeping this in view, the population of the state is under heavy pressure and the number of marginal farmers and agricultural labourers in the farming families is higher. The heavy pressure over the land is reflected by the high share of Bihar in agrarian riots. These riots include conflict over land and water which have increasingly come under stress owing to weather-related shocks and inadequate policy attention. 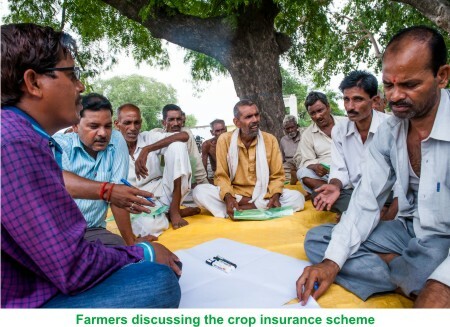 Crop insurance schemes become relevant in the face of climate change which will increase farmer uncertainty, necessitating effective insurance. 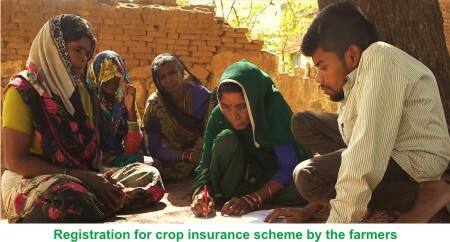 A recent scheme launched by the Government of Bihar for insuring the crop and providing fair compensation to the farmers on time is the Bihar Rajya Fasal Sahayata Yojana. Under this scheme, all the farmers are required to register on the online portal for each season (Rabi and Kharif). Currently, this ambitious scheme has been implemented in Kharif season in the state. Initially, the last date for the registration for paddy and maize in the Kharif season was valid till the 31st July 2018. Application of interest towards this scheme is only valid after registering online. After registration, the benefits of the scheme can be availed by both Rayat5 and Gair-Rayat6 farmers without payment of any kind of premium or any other amount. The farmers can get a compensation of up to a maximum of 2 hectares land. • For crop damage in the range of 1-20%, a compensation of Rs. 7.5 thousand per hectare would be paid. • For crop damage of more than 20%, a compensation of Rs. 10 thousand per hectare would be paid. Here the crop damage is assessed for each panchayat using the average of last 7 years. Under this scheme, ‘11,50,533’ farmers have registered up till 19th November 2018. The registration process has been inadvertently delayed by 5 months, from the last date which was till the 31st of July. Server error for the registration of such projects was one of the reasons. The delay in the registration has made the whole act of assessment of crop damage by the Kisan Sahlakar redundant as the Kharif crops have already been harvested. Hence, a mismatch between the dates of harvesting and crop damage assessment activity. If the crop damage is not assessed the whole insurance scheme collapses and the time and money invested is lost. Further, there are questions as to how the damage would be assessed in case the farmers lose their crops at the initial stage at the time of sowing; or lose their crops in case of fire or other such problems. Another problem is that, the programmme is being implemented at the Zila level with only one executive officer at the block level, increasing the load and making the registration process inefficient. From the farmers’ end, a lack of awareness about the scheme can be noticed which leads to a slow turn up for registration at the initial stage. The long list of documents is a deterrent to the farmers. One such document is the Land Possession Certificate, a must have for the Rayat farmers. The Land Possession Certificate is not issued to the wards who have inherited the land from their father, and the land is not registered under their name. There is no record of inheritance due to absence of land records in Bihar. Making it further more difficult is the fact that the land possession is valid only for 6 months. 4. NCRB. (2015). Accidental Deaths & Suicides in India. NCRB, http://ncrb.gov.in/StatPublications/ADSI/ADSI2015/chapter2A%20suicides%20in% 20farming%20sector.pdf.